No Die Handbag Style Pillow Box! Welcome to my Blog and thank you for stopping by today! 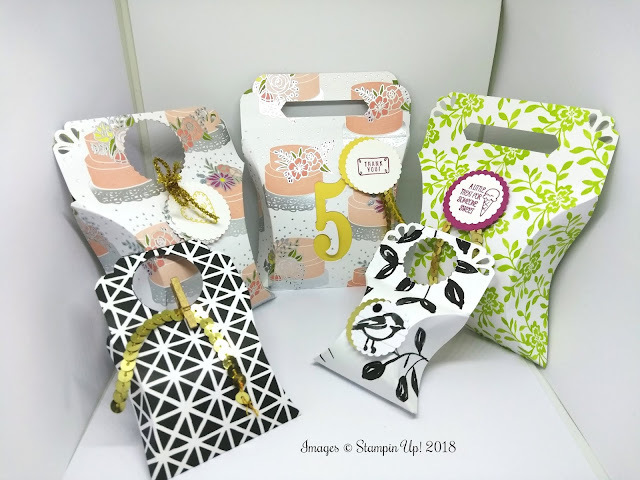 I came across these gorgeous pillow boxes the other day on YouTube by a Lady called Rejoice & Create/. I thought they were so cute, clever and very easy to make. You can also make them in different sizes and i think they would be perfect for Weddings, Birthdays and just to pop little gifts in. I hope you like them. As the title states you don't need a die to make these cute boxes. All you need is something circular to score around. I used a large plate and also a large circle die to make some of mine. The width of your pillow boxes will depend on how big your circular object is. You will also need a punch or die to make your little handle. LARGE PILLOW BOX, DSP MEASURES 6 X 11"
SCORE THE LONG SIDE @ 1 1/2", 5 1/2" & 9 1/2"
SMALL PILLOW BOX CARD MEASURES 8 X 4"
SCORE THE LONG SIDE @ 1 1/2", 4" & 6 1.2"
PLEASE CHECK OUT MY TUTORIAL FOR FULL INSTRUCTIONS, YOU CAN FIND THE LINK AT THE END OF THIS POST.